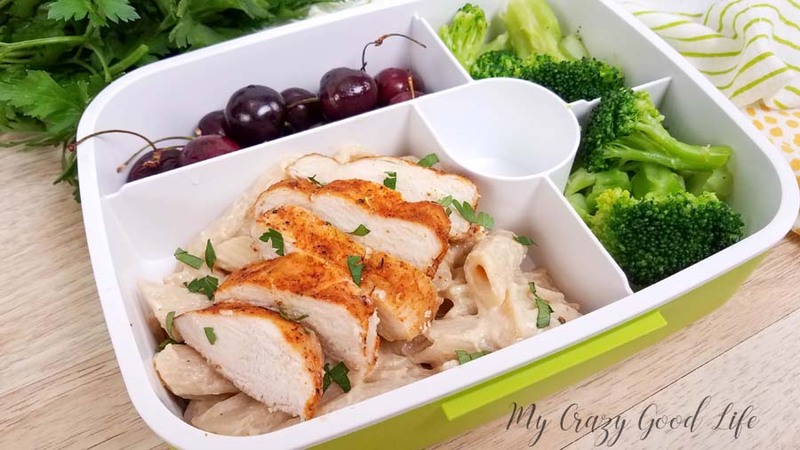 This cajun chicken alfredo is a healthy dinner recipe the whole family will love. 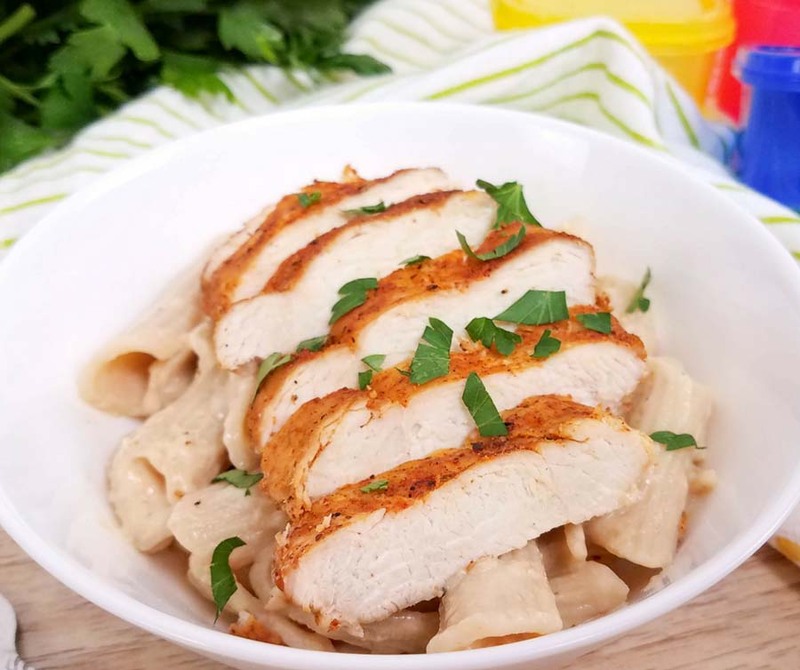 It’s a spicy take on a healthy chicken alfredo recipe! This healthy alfredo sauce recipe is super versatile so you’ll want to keep it on hand for all your pasta dishes! Making this healthy chicken Alfredo sauce is easier than you might think! 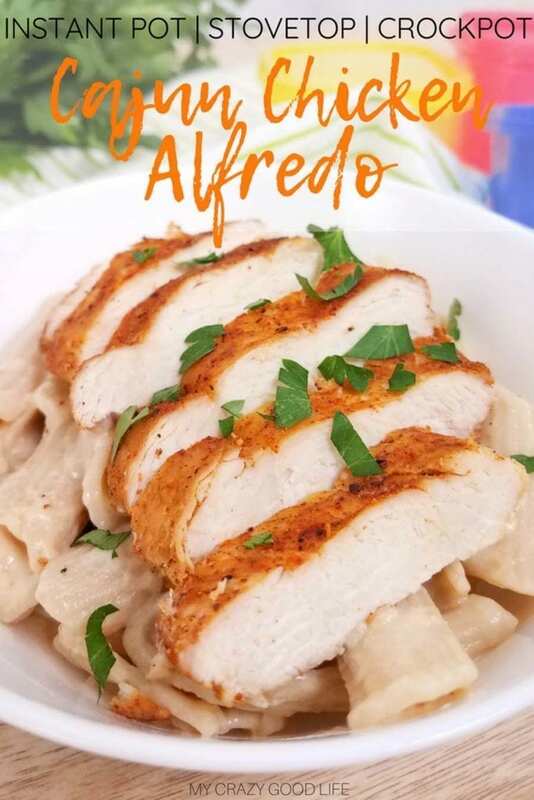 It’s a 21 Day Fix Alfredo sauce that is also great for 2B Mindset, and you can use it in all of your favorite Alfredo dishes. The cajun part of this dish comes from the flavors in the chicken so this sauce ends up being very versatile. If you are looking for a lighter Alfredo sauce give this one a try. It’s just a few ingredients and it’s easy to make! To make this healthy Alfredo sauce just blend the ingredients and pour over warm pasta. Include some freshly grated parmesan cheese and stir until melted and smooth! It doesn’t get easier than that right? 1) Turn the Instant Pot to saute, then press the adjust button until “more” is selected under the display. 2) Cover the chicken with olive oil and Cajun seasoning. When the Instant Pot reads “HOT” saute the chicken for 2-3 minutes on each side to make them crispy. Set the chicken aside. 3) Add 3 cups of water to the Instant Pot and deglaze the pan. Dump in the pasta, give it a quick stir then place the trivet on top of the pasta. 4) Set the chicken on the trivet so that it does not touch the water. 5) Close the lid and turn the pressure valve to sealing. Good on high pressure using the manual setting for 5 minutes. Let pressure release naturally. 6) While the pasta is cooking blend together all the ingredients for the alfredo sauce. Set aside until ready to use. 7) Remove the chicken from the Instant Pot and slice it. While the pasta is still hot stir in the parmesan cheese and blended alfredo sauce. Mix until the parmesan cheese is melted. Serve immediately and top with the sliced chicken. 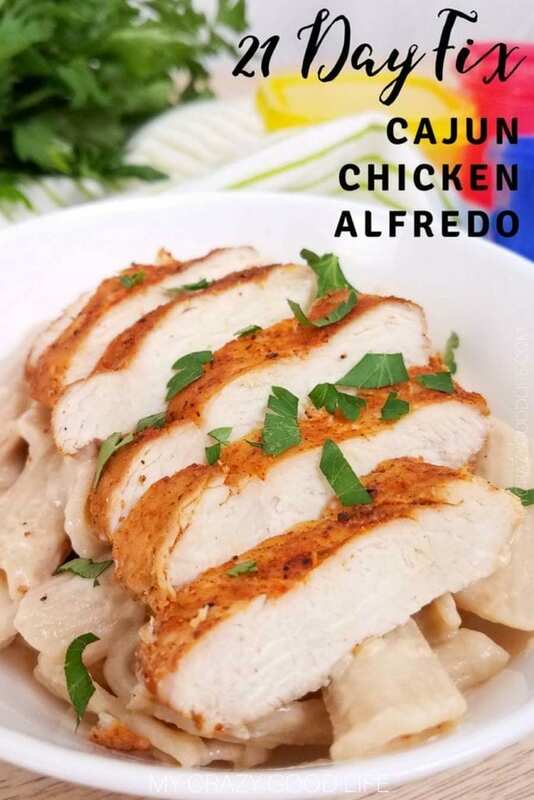 Can I make this cajun chicken alfredo on the stove? Yes! This recipe is really easy to make in a couple of different ways. Here are the stove top instructions and you can keep reading for the Crockpot version as well! 1) Cover the chicken with olive oil and Cajun seasoning. Heat a large skillet on high heat on the stove. When the skillet is hot saute the chicken on each side for 2-3 minutes until it gets crispy. Remove the chicken from the pan and set aside. 2) Add the water to the skillet and deglaze the pan. Pour in the pasta. Move the chicken back to the pan and set it on top of the chicken. 3) Bring the water in the skillet to a boil then cover the pan and reduce the heat to medium low so that the liquid keeps simmering. Cook the 12-15 minutes stirring occasionally until the pasta and chicken is cooked through. 4) Remove the chicken and slice. 5) Blend the ingredients for the sauce. Pour the alfredo sauce and parmesan cheese over the pasta. Serve while still warm and top with the sliced chicken. 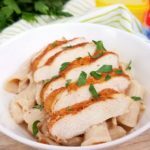 Is there a Crockpot version of this cajun chicken alfredo? Absolutely! 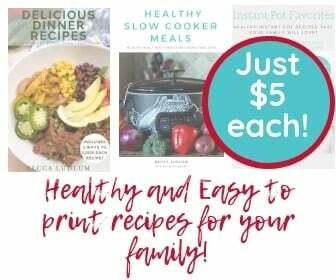 I’ve been trying to make my recipes as accessible as possible so whenever it works I include directions for the pressure cooker, the stove / oven, and the Crockpot! Please use whole grain noodles for the crockpot version of this dish. 2) Add the water, and chicken to your slow cooker. Cover and cook on low heat for 2-3 hours. Add the pasta during the last 30 minutes of cook time! 3) Remove the chicken and slice. 4) Blend together the ingredients for the alfredo sauce. 5) While the pasta is still hot in the slow cooker mix in the parmesan cheese and blended alfredo sauce. Serve while still warm topped with the sliced chicken. TOTAL recipe count, per 3/4C chicken plus 1C pasta with sauce: 1 2/3R, 2Y, 1/3B. 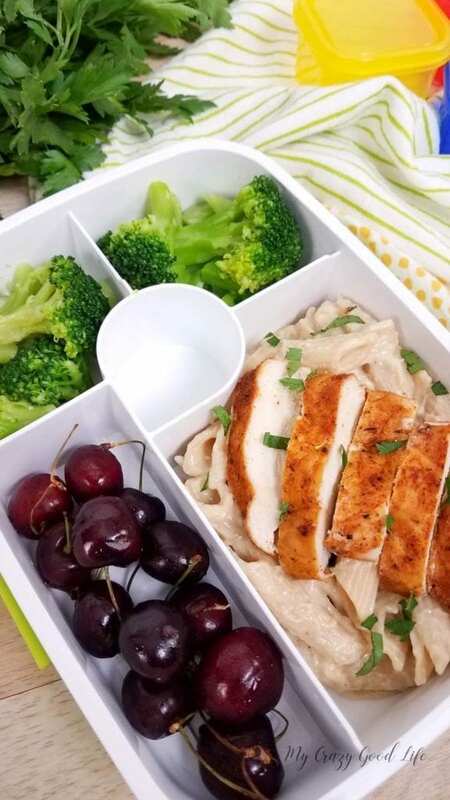 Can I reduce the carbs in this Healthy Alfredo recipe? Note: If you’d like to reduce the yellows/carbs, you can reduce the water to 1 1/2 cup and cook 6 ounces of pasta–this will change your 21 Day Fix container count to 6Y for the entire recipe, 1Y per serving. This is a great lunch recipe! You can use the chicken separately for dinner if you make it with zoodles instead! Turn the Instant Pot to saute, then press the adjust button until "more" is selected under the display. Cover the chicken with olive oil and Cajun seasoning. When the Instant Pot reads "HOT," saute the chicken for 2-3 minutes on each side to make them crispy. Set the chicken aside. Add 3 cups of water to the Instant Pot and deglaze the pan. Dump in the pasta, give it a quick stir then place the trivet on top of the pasta. Set the chicken on the trivet so that it does not touch the water. Close the lid and turn the pressure valve to sealing. Cook on high pressure using the manual setting for 5 minutes. Let pressure release naturally. While the pasta is cooking blend together all the ingredients for the alfredo sauce. Set aside until ready to use. Remove the chicken from the Instant Pot and slice it. While the pasta is still hot stir in the parmesan cheese and blended alfredo sauce. Mix until the parmesan cheese is melted. Serve immediately and top with the sliced chicken. Cover the chicken with olive oil and Cajun seasoning. Heat a large skillet on high heat on the stove. When the skillet is hot saute the chicken on each side for 2-3 minutes until it gets crispy. Remove the chicken from the pan and set aside. Add the water to the skillet and deglaze the pan. Pour in the pasta. Move the chicken back to the pan and set it on top of the chicken. Bring the water in the skillet to a boil then cover the pan and reduce the heat to medium low so that the liquid keeps simmering. Cook the 12-15 minutes stirring occasionally until the pasta and chicken is cooked through. Blend the ingredients for the sauce. Pour the alfredo sauce and parmesan cheese over the pasta. Serve while still warm and top with the sliced chicken. Add the water, and chicken to your slow cooker. Cover and cook on low heat for 2-3 hours. Add the whole grain pasta during the last 30 minutes of cook time! Blend together the ingredients for the alfredo sauce. While the pasta is still hot in the slow cooker mix in the parmesan cheese and blended alfredo sauce. Serve while still warm topped with the sliced chicken. Can you explain step 2 when using the stove top? Do you put the chicken in the water?